I thought that “The Inferior”, the first book in this trilogy was a very original science fiction novel that wasn’t quite like anything else I’d read. The vision of a nightmarish world without any edible vegetation where the only way humanity can survive is by making war on and eating the other sentient alien races which inhabit the world is a very memorable premise. The sequel, “The Deserter” had taken the protagonists out of their own world and put them in a more conventional SF setting which lead to some interesting clashes of culture. Sadly the series didn’t seem to catch on (perhaps the premise was just a bit too weird for many readers?) 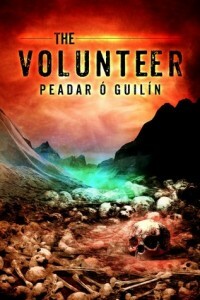 so it initially looked like there might never be a concluding volume in the trilogy after it was dropped by its publisher but it has now been completed by the self-published “The Volunteer”. I was initially a bit surprised that the first half of the book didn’t feature Stopmouth or Indrani, the series two main characters. Instead the story returns to their former home, the beleaguered tribal stronghold of Manways, now coming under increasingly under threat from the vicious aliens known as the Diggers, who continue to be the most unpleasant creations in the series. This part of the book is told from the perspective of an aging hunter named Whistlenose who is starting to feel that his days in the Tribe are numbered especially after he starts to clash which his chief Wallbreaker and Wallbreaker’s new adviser, an untrustworthy man recently arrived from the dying civilisation of The Roof. A large part of the book follows the journey of Wallbreaker’s tribe towards supposed salvation across a landscape where most of the creatures they encounter want to kill them and eat them (and not necessarily always in that order). There are some fine action scenes along the way and the Tribe’s perseverance in the face of odds that seem increasingly insurmountable does make for a compelling story. The Diggers make for extremely effective antagonists and Wallbreaker is an interesting antihero, genuinely trying to help his tribe survive but also ruthlessly dedicated to his own survival. I was a bit less keen on his new adviser, Aagam, who feels like a fairly simplistic villainous character without any redeeming qualities. Whistlenose is a good protagonist for this part of the story, while he is more articulate than Stopmouth was in the first book he is equally likeable and goes on a similar journey where his initially unquestioning loyalty to his chief starts to clash with his determination to do the right thing. I think it was a good decision to start the novel with a return to the setting of the first book rather than immediately picking up the next chapter in Stopmouth and Indrani’s story but we do eventually witness their return to the human colony they had founded at the end of The Inferior. This part of the story focuses on the clashes between different parts of the disparate society as they disagree over how best to survive in the face of the menace of the approaching Diggers. Inevitably, Stopmouth and his brother Wallbreaker are eventually reunited and as well as the continuation of their sibling rivalry this also complicates the situation as Wallbreaker makes his own power play for control over the last remaining humans and Stopmouth tries to come up with a final solution for the Digger menace. I thought the ending of the book was a satisfying conclusion to the trilogy with some tense scenes where the survival of any of the characters didn’t seem assured although some subplots did seem slightly rushed and other than Wallbreaker the other human antagonists did feel a bit caricatured. Overall, I’d say the trilogy was definitely worth reading with a unique and memorable premise (albeit one that might ruin your appetite if read before dinner).